RETIREMENT SCHEME LAUNCHED: (From left) Mike Chan, officer-in-charge of RHB Investment Bank Bhd; Dato’ Mohamed Khadar Merican, chairman of RHB Capital Bhd; and Patrick Chin, chairman of RHB Investment Management Sdn. Bhd, officially launch the financial product. KUALA LUMPUR: The RHB Banking Group, through RHB Investment Management Sdn. 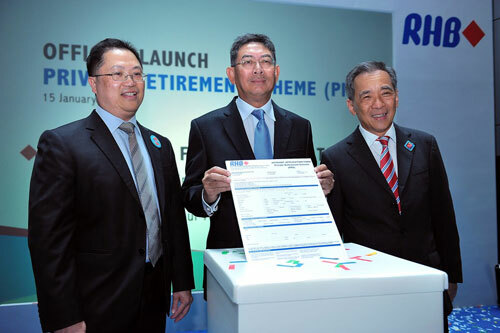 Bhd (RHBIM), has launched the RHB Retirement Series under the Private Retirement Scheme (PRS). RHBIM is one of the eight PRS providers appointed by the Securities Commission Malaysia earlier this year. The RHB Retirement Series comprises three core funds, namely the RHB Retirement Series – Growth Fund, which is targeted for contributors below 40 years of age who have a higher risk appetite; the RHB Retirement Series –Moderate Fund for contributors aged between 40 to 49 years old who can accept moderate risks; and the RHB Retirement Series – Conservative Fund, which is for those above the age of 50 who are low risk takers. “There’s a huge financial gap between savings for retirement and leading a sustainable lifestyle post retirement for many Malaysians. Most of our savings for the golden years might not be able to last throughout our retirement due to the longer lifespan and rising cost of living. “With the PRS, Malaysians now have another means of closing this gap as it complements their existing retirement plans. The PRS also opens up another channel for us to tap into a huge potential market which is in line with our Group’s mission of becoming the preferred private retirement destination”, says Anthony Siau, acting principal officer of RHBIM. RHB Bank, the primary distributor of the RHB Retirement Series, has nearly 190 branches nationwide, giving the general public easy access to the services of its trained personnel. In addition to the bank’s wide branch network, RHBIM has a wealth of experience in fund management. RHBIM has been managing unit trust funds since 1992 and retirement funds since 1995 with over 28 multinational corporations’ retirement funds and institutional clients. These include government agencies, universities, insurance companies, foundations and charities. RHBIM is a wholly-owned subsidiary of RHB Investment Bank and currently has a stable of 23 retail funds.